Terry M. submitted this photo and caption. 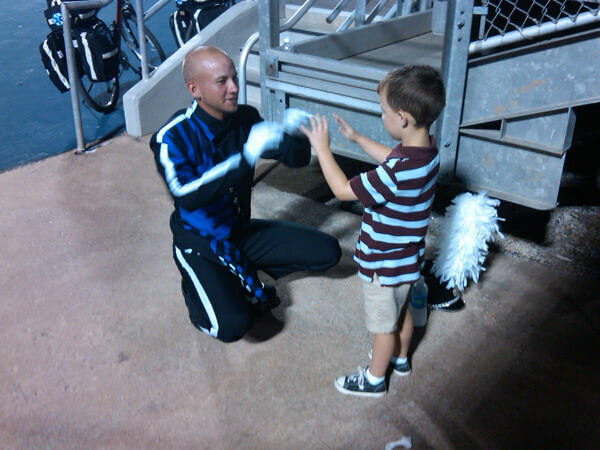 This is a picture I caught of my friend Andrew R. of the Blue Devils, teaching a four-year-old youngster, from the crowd, to direct at the Tour of Champions show in Murfreesboro, Tenn. this summer. Andrew was showing him to direct in 4/4 time using "one potato, two potato, three potato, four." As you can see from the photo, Andrew's teaching style worked, as this little boy was "locked-in" to his teacher and never noticed me.